Children’s Hospital & Medical Center is nationally known for providing top-notch care to the smallest of patients. With demand always high and the hospital consistently near or at capacity, a large expansion is underway so the hospital can provide care to even more children. OPPD worked with Children’s early to make sure the expansion could happen, and that disruptions would be minimal. The expansion includes a nine-story, state-of-the-art clinical facility – the Hubbard Center for Children – that will house newborn and pediatric intensive care units, cardiac and cancer units, surgical space and other services. Located on the north end of the campus, the new facility will open in 2021. 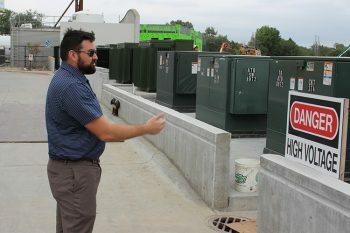 John Kelly describes the electrical equipment installed by OPPD to serve the new hospital expansion. 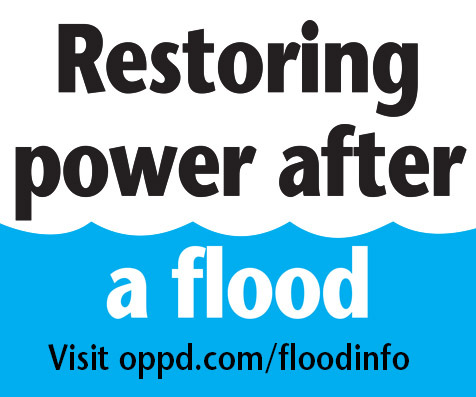 OPPD knew it was critical to keep power flowing to the campus. The utility moved electrical services to the east end of the hospital and worked to ensure disruptions were minimal. OPPD’s work was the first leg in the expansion. The area is now full of construction workers daily along 84th Street and West Dodge Road. A big milestones occurred in March, when utility workers switched power over to the new service. Nurses and others in the pediatric intensive care unit tweeted a photo showing staff wearing head lamps in preparation for the switchover. Officials with Children’s said being left in the dark is a scary prospect for their young patients who already face a stressful situation. OPPD did the work during daylight hours even though working overnight would have been ideal. Hospital staff planned fun activities in case they were “in the dark” for an extended period, and staff made sure they had the head lamps, too. No need. OPPD crews completed the work ahead of schedule. Additional video footage courtesy of Children’s Hospital & Medical Center.